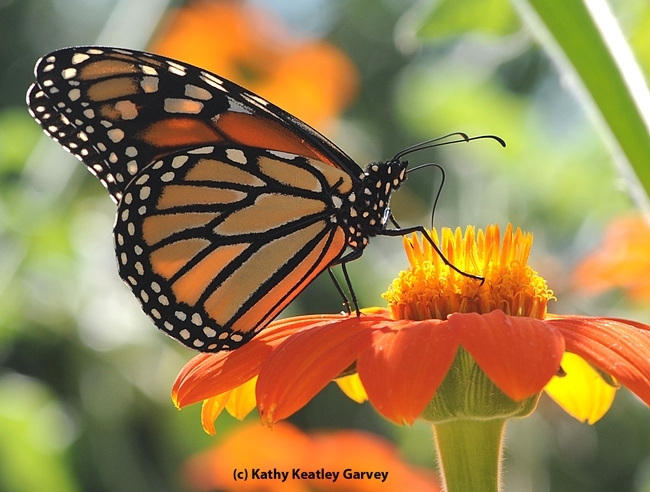 We're accustomed to seeing a solitary monarch butterfly (Danaus plexippus) flitting around a garden. It was interesting to read the National Public Radio piece (Oct. 4) on Flight: A Few Million Little Creatures That Could. The feature news story traces how a "young boy in Canada wondered where butterflies go in the winter--and spend 40 years trying to answer that question." "In 1973, Dr. Fred Urquhart--all grown up by then--placed an ad in a newspaper in Mexico looking for volunteers to tag and observe butterflies and find their destination." A woman and her husband answered the ad, and in the course of two years, found "hundreds of millions of butterflies." If you access the NPR website, you'll see clips of a documentary made by Mike Slee. It's called the "Flight of the Butterflies," which NPR describes as a "3-D IMAX film about the migration of the monarchs to sanctuaries." "What you see, you can't imagine nature ever being like this," Slee tells NPR. "Trees that are draped — that are made, almost, of butterflies. It's got a surreal, supernatural feeling to it. It sends a sort of tingle up your spine when you see it in 3-D. And then they wake up and they all begin to fly." NPR goes on to say that "the migration of the monarch butterfly is a staggering natural phenomenon. It takes two or three generations for the creatures to make their way north to Canada — but then one 'supergeneration' makes the 2,000-mile trip back to Mexico for the winter." At UC Davis, emeritis professor Hugh Dingle is a noted authority on the migration of animals. He's been featured in National Geographic and other magazines. The good news is that he's writing the second edition of his popular textbook, Migration: The Biology of Life on the Move (Oxford University Press). Dingle, who is headquartered in the Sharon Lawler lab in the UC Davis Department of Entomology, was featured in the National Geographic magazine's cover story, "Mysteries of Great Migrations." Frankly, we don't see as many monarchs as we'd like to. Seeing even one monarch "sends a tingle up the spine." Plant and insect enthusiast Gary Zamzow of Davis--and an excellent photographer--recently planted some milkweed (the monarch's host plant) in the Häagen-Dazs Honey Bee Haven, a pollinator friendly garden located next to the Harry H. Laidlaw Jr. Honey Bee Research Facility on Bee Biology Road, UC Davis. Hopefully, the milkweeds will attract many of those mighty monarchs next year and send lots of "tingles up the spine."